Just wanted to pop in and say hello! Thanks for coming by the Ustream show tonight as I finally got to dig into the Ranger box! Yahoooooo! How many cool things can come in one box! Just sayin'! LOVE! Ranger products just knock my socks off! So many really awesome products! I also had to show off my amazing gifts of art from Jodie Beck, Sharon Young and Linda Bates! Thank you so much! They are amazing! I'm so blessed! Well, I'm on the road again! Actually, airplane again! Just the word airplane turns my stomach into nervous knots...But I'm getting better! Yahooooo! I just think about Charlie Labonte, The Hens' Den and the fun time we're going to have and it all gets soooo much better! Hahahaha! 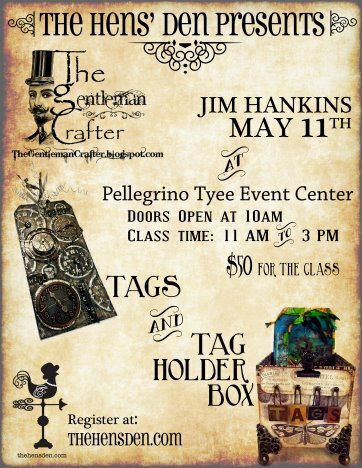 If you are around the Seattle, Olympia or the Tumwater area, come on down to the Pellegrino Tyee Events Center and give me a hug Saturday! Love me some hugs! We are going to have a blast! Wish I had known! I live in the Seattle area but unfortunately can't make it. So accept this virtual hug from me and welcome to Washington! So sorry I missed your Ustream last night - I forgot it was Tuesday! We had a public holiday here in the UK on Monday and I got mixed up with the days - it's an age thing LOL! Enjoy your next trip and I hope you're not sleepless in Seattle! Wow! Sounds amazing Jim. Hope you have fun. Omgosh!! YouTube led me to one of your videos. Right when I heard you say "ya'll" , I knew you were from near me! I'm so glad to have ran into ya. I'm lovin all your tutorials and learnin so much. Have a safe and FUN trip. Be afraid, be very afraid. I know what you look like, but you don't know what I look like! BAWAHAWAHA! ;) See you Saturday buddies! So wish I could go with you! I know your class will be special and everyone will love the projects!! Safe travels, my friend!!! Wow! You're off again! You'll soon be able to call yourself, Gentleman Jim the Jetsetter Crafter with all your travels. I'm sure you'll have a fabulous time. Can't WAIT! Three days to Tumwater, counting today! And you betcha there will be hugs, Jim! I've gassed up the car, packed my crafting mat and I'm raring to go. I can't say how many years since I've been to Tumwater. So looking forward to seeing you guys. Nan's right - we have lots of hugs to go around. P.S. - Yes - the new Graphic 45 Halloween paper is to die for. Just the stamps have got me jumping up and down! Wishing you a relaxing plane trip - hopefully no detours this time - LOL . . . they are going to love you!!!! Sorry we missed your Ustream... had to work late! Have a safe trip and most of all... FUN GETTIN' INKY!!! Gosh I hope you got to keep that poster - so cool! Can't wait to hear all about your trip!